And on to the next big build! 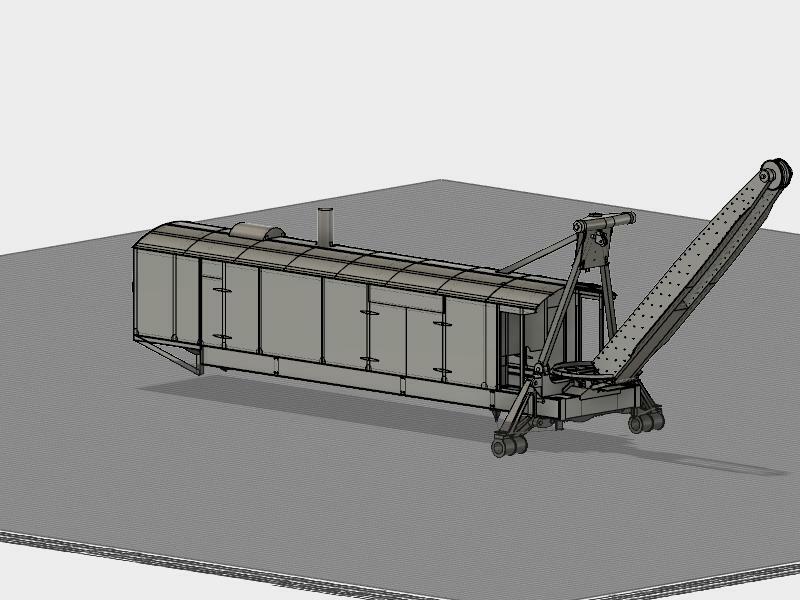 The next project is plans then model for a Marion Model 91 steam shovel, of the type used on the Panama Canal and lots of other large excavations. There happens to be one of the last ones existing sitting in a field outside a quarry near where I live. 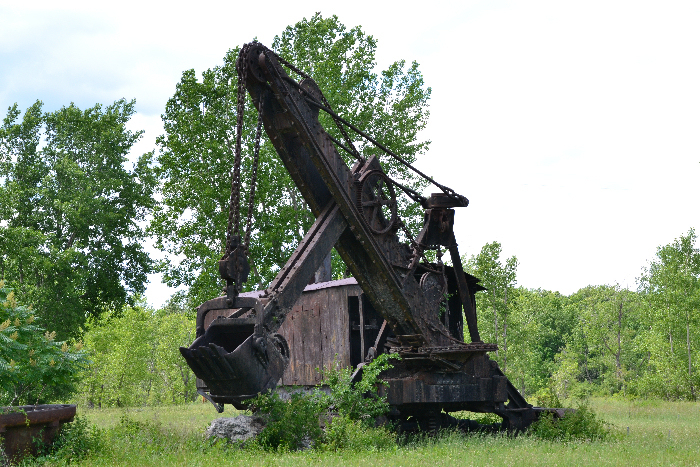 It was used in the quarry starting in approximately 1906, then abandoned in the field in 1949. It was originally a railroad truck mounted machine, later on it was converted (using tracks made by Marion) to sit on 2 pairs of crawler tracks - front powered, rear steerable. The town acquired the land it sits on in the 1960s, and it later was added to the national landmark registry. Here are some photos of what it looks like now. I have been working with the town historical society and others, and have gotten some photos and measurements from them, plus photos of the outside of my own, and a set of digital laser scans that were done about 10 years ago. Next month I should be able to get inside during a park service survey, and get more detailed internal photos and measurements. I've also gotten copies of two of the original Marion product catalogs which show tons of detail (as they brag about the features) of the internal parts, and also have downloaded a bunch of their patents from the early days, which are another gold mine of information about the internal workings. 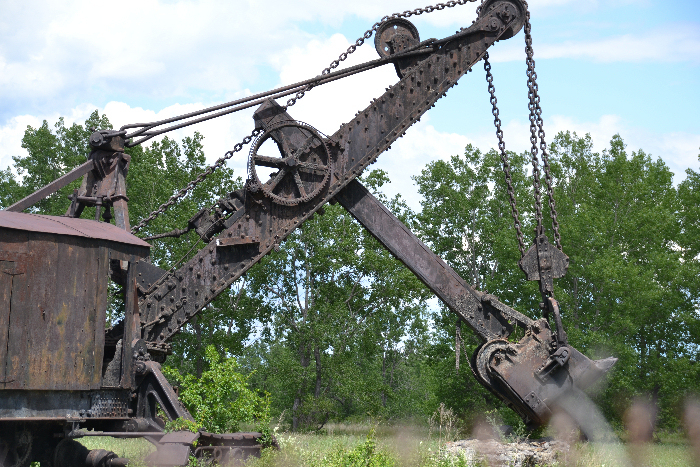 As you can see, there are a pair of large outriggers at the front end - these take the place of the original jack stand supports from when it was rail-mounted. The outriggers are what the crawler track hubs attach to. They have a set of u-koints connecting back to the central drive hub (not modelled yet) to propel the machine. 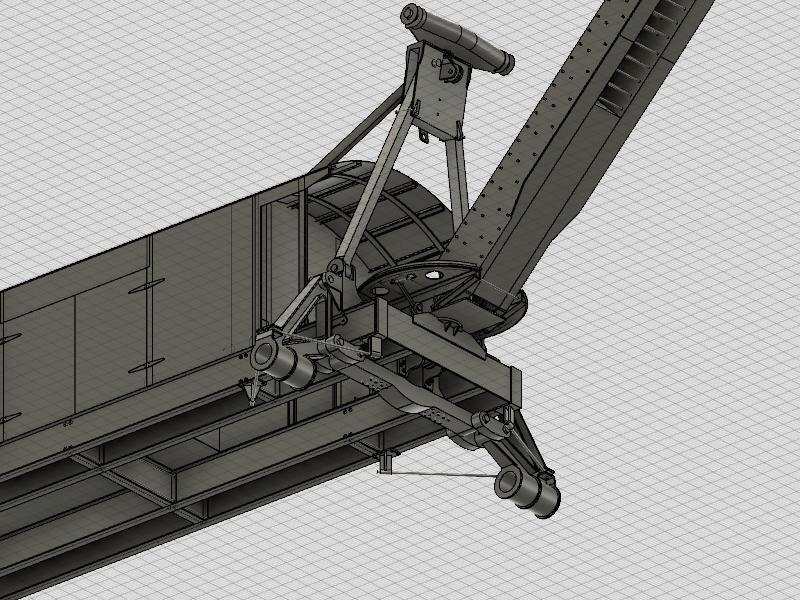 The rear tracks are a pair that sit close together under the original rear truck mount, and is steerable by a long worm gear which is driven by a fourth steam engine that was added as part of the crawler 'kit'. The other steam engines are: one on the main boom to run the dipper boom in and out, one to swing the front booms side to side on the turntable, and one to drive both the main bucket hoist and also the axles to move the machine. Quite a mechansim! 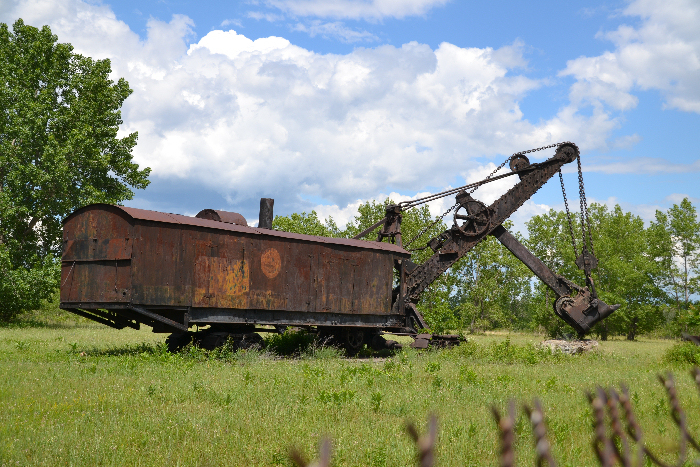 Other changes that were made to the machine during its life: the folding rear deck that would hold coal for the boiler was converted to a permenant platform, and also the wooden sides were replaced with sheet steel. So, for now, the research and 3D drawing will continue for a while, then I'll pick the scale and make up the plans for the model and start construction. I'll post updates as the 3D model progresses and as I get more research done. What a wonderful undertaking! This will be a significant prototype model. What I really need is for you to build me one of your wonderful dioramas of a workshop at 12":1' scale so I could build a real steam shovel!! I think I have a location set to display the Lombard, have no clue where to put the shovel when it is done, unless I can make it to the kind of scale that George builds. Well Chris........you could always put it to work digging a swimming pool in your backyard! This is going to be another great project. I'm looking forward to following along. Oh oh! Having commented the :popcorn:else where, now I have to split it up! Shouldn't be too long before I can plant up the field again! This should be another fun build to follow! Should be a good long ride on this one, lots of frames and body works, 4 twin cylinder engines, 4 crawler tracks, plus the booms and bucket. And a turntable! Too bad there isn't a working one to play with along the way. At least for this one the chains are a style I can buy by the yard! So just open side by side browser windows and munch popcorn while turning your head back and forth!! Think it might have to be a bowl for each hand! Wow, what a project Chris!! Oh yes, the tracks will have to be machined up. these don't have the interlocking fingers on the outer plate, must have a joint on a inner T, can't tell from the pics I have now, but am getting a chance to inspect up close in a couple of weeks. Hey, pass some of the popcorn this way! Great project and another that has been on my list for years, looking forward to it! OK, ready to follow along. Bad Behavior has blocked 12962 access attempts in the last 7 days.